The GVKVGIH Dual SIM adapter lets you switch between your SIM cards in two easy clicks using your iPhone's existing menu.With a GVKVGIH Dual SIM adapter. GVKVGIH is the perfect solution for business people, travelers, commuters, or anyone who uses more than one SIM card or phone number. 6, Full internet access, video calls, etc. 【Main Function】The most advanced adapter on the market, specifically designed for iPhone. Its ultra-slim chip is optimized using the newest Dual SIM technology, offering enhanced performance, quicker switching, and greater compatibility than previous models. 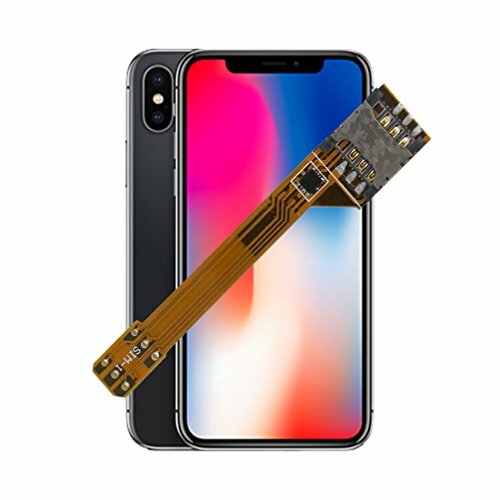 【Application Range】GVKVGIH dual sim adapter chip compatible with iPhone X 8 8Plus 7 7Plus 6S 6Plus and all iPhone firmware / IOS versions 11, 10, 9, etc. (including all previous versions) , It doesn't need to install the APP, simple installation. 【Easy DIY,Easy install】Important:Please watch our video first in our website before install(website is provided in instruction). It requires no modification to your SIM cards. Your SIM cards simply fit into the adapter. Then insert into your iPhone SIM slot. If you have any questions about this product by GVKVGIH, contact us by completing and submitting the form below. If you are looking for a specif part number, please include it with your message.